There are presently 370 cars (70 Automatics) available on the Scheme that do not require an Advance Payment, or even all of your award. There are a few hidden gems and don’t forget if you are getting a new Motability car after completing your three year lease you are entitled to a good condition bonus of £250 (providing the vehicle is returned in good condition) that will arrive in the form of a cheque usually within a week of collecting your new vehicle. 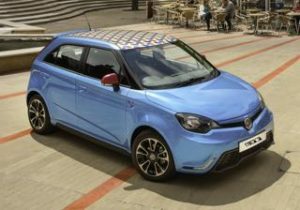 The MG3 is a bit of a surprise, it’s roomy, sporty to look at, fun to drive and does have the rare commodity of having a bit of a kerb appeal. The 1.5 litre petrol engine with 105bhp can take you to 62mph in 10.4 seconds and return 51.5 miles per gallon, so it is not the most economical and to get the best from the engine it does need to be revved hard. The level of equipment is excellent, 16 inch alloys wheels, LED daytime running lights, CD player with aux/USB input, bluetooth, DAB radio, all round electric windows, leather steering wheel with audio controls, very supportive sports seats, electronic air conditioning, electrically adjustable heated wing mirrors and remote central locking. 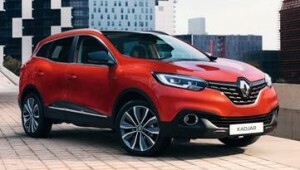 The Renault Kadjar is a sister car to the Nissan Qashqai, being born out of the long running Renault – Nissan Alliance. Despite using parts and sharing engines with the Qashqai, the Kadjar is slightly longer and has a bigger boot as a result – up from 430 litres in the Nissan to 472 litres. Dynamique trim has a built in Sat-Nav paired to the 7″ touchscreen and DAB radio, 17 inch alloy wheels, cruise control, privacy glass, auto headlights and wipers, keyless entry and climate control. The 1.5 litre diesel offers a 0-62 time of 11.9 and economy of 74.3 miles per gallon from a six speed manual gearbox. The Petrol engine choice is between the Hyundai Tucson, Kia Sportage and slightly smaller Nissan Qashqai. 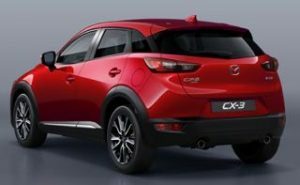 As well as being quite a looker from the pavement the Mazda CX-3 really stands out from behind the wheel, it’s possibly the best small crossover to drive, the turbo-less 2.0 litre petrol with 118bhp is an excellent all rounder, 0-62 in 9.0 seconds and while the claimed economy of 47.9 miles per gallon is unrealistic real life figures suggest 42 mpg is achievable. Excellent space up front but this diminishes as you move through the car culminating in a 350 litre boot. Standard equipment is fantastic, climate control air-conditioning, cruise control, start/stop button, 16 inch alloy wheels, auto lights, rear parking sensors, DAB radio, 7 inch touchscreen with built in sat nav, heated front seats. Also worth a mention as a manual gearbox car are the Citroen C3 Aircross, Hyundai Kona, Fiat 500X, Kia Stonic, Vauxhall Mokka, Seat Arona and MG ZS. The A1 may be the smallest Audi but there is no lacking the quality of build, the interior is a delightful place to be and the driving experience is comfortable and assured. The Sport Nav trim boasts a 6.5 inch pop up screen which includes a built in Satellite Navigation system powered from a SD card, 16 inch alloy wheels, manual lumbar support, Audi Drive Select, sports seats and stiffer suspension. The three cylinder 1.0 litre offers 94bhp and has enough pep to reach 62 in an impressive 10.9 seconds and can return 67.3 miles per gallon. If you want hot hatch performance then the (Nil advance Payment) Abarth 595 is the car for you, Based on the Fiat 500 but fitted with a 1.4 litre turbo charged petrol engine that delivers 145bhp. The robotised sequential automatic gearbox (with steering wheel mounted paddles) gets you to 62mph in 7.8 seconds and on to a top speed of 127 mph. Economy is a claimed 47.1 miles per gallon. The Abarth is so much fun, the engine revs freely and handling resembles a go-kart. 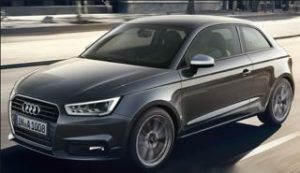 Spring Best Buy – Audi A1 1.0 litre Sport nav petrol 3 dr manual – Nil Advance Payment (£60.87 wpms) or Abarth 595 – Nil Advance Payment (£60.87 wpms) As an Automatic Choice. The New Ibiza, with its sharp creases, looks like a shrunken Leon, and that’s certainly no bad thing. The Ibiza is based on the VW Polo and is agile to drive and comfortable to be in and has been awarded super-mini of the year by Auto express. The three-cylinder TSI 1.0-litre turbo-petrol (Manual or DSG Automatic) with 113bhp is competent and willing, 0-62 in 9.3 seconds and is only available in Sporty FR trim which comes with a flat bottommed steering wheel, sports seats, sports suspension, a driving mode selector along with an excellent 8 inch touchscreen. The Vauxhall Corsa is due to be upgraded next year but it remains a fresh looking small hatchback and in SE Nav trim it is loaded with equipment: front and rear parking sensors, cruise control, manual air conditioning, 16 inch alloy wheels, heated front windscreen, heated seats, heated steering wheel, 7 inch infotainment system with DAB radio, built in sat nav and apple carplay/android auto link, you also get OnStar, the excellent onboard assistance but only until 2020 as Vauxhall have announce they are turning it off. Shame. The 1.4 litre petrol with 89bhp is avaialble as a 5 speed manual or six speed automatic and can reach 62 miles per hour in 13.2 seconds and return up to 55.4 miles per gallon or 47.9 as an auto. The Ford Fiesta is an excellent alternative with a more sprightly engine, super dual clutch automatic gearbox and a more modern design but to add heated seats and steering wheel to the included heated windscreen, you have to pay an extra £250. 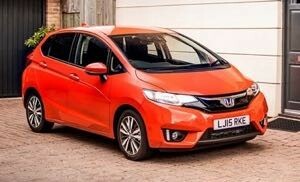 The Honda Jazz treads a path between a hatchback and MPV and has a ‘Tardis’ like feel to it, all Jazz models get Honda’s brilliant Magic Seat setup, the rear seats can lift like a cinema seat and the rear bench can fold completely flat in a swift single motion. The boot is also a near class leading 354 litres in size. Equipment levels across the range are excellent, all cars have cruise control and automatic lights, while mid-range SE cars get a 7 inch infotainment system (no Apple Carplay/Android Auto connection, to get a Sat Nav you have to upgrade to the ‘Navi’ grade), parking sensors, electric mirrors and 15 inch alloy wheels, top-spec EX trim vars have keyless entry and start, climate control and a reversing camera, 16 inch alloys, fog lights and LED lights. The 1.3-litre petrol with 101bhp performs very well, smooth and quiet with ample power, 0-62mph time of 11.2 seconds when connected to the manual gearbox. The CVT automatic takes longer to reach 62mph, hitting the speed in 12 seconds. It’s reasonably economical too offering 56.5 mpg as a manual or 61.4 miles per gallon as an automatic. The Vauxhall Crossland X and Ford C-Max are available with a manual gearbox without an advance payment. 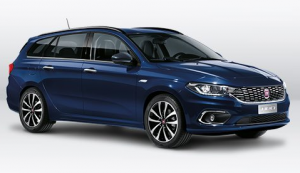 The Tipo estate is simply a great looking car that offers room for a family. The 550 litre boot offers low loading and the rear seats have enough head and legroom for adults. The 1.4 litre petrol engine only produces 94 bhp so a fully loaded car will mean diving through the 6 speed manual gearbox to get up the big hills. On the flat it will reach 62mph in 12.3 seconds and 115 mph flat out. Economy is a claimed 49.6 miles per gallon. The Easy Plus trim comes with a 5 inch (small) infotainment system with DAB radio, rear parking sensors, LED running lights, fog lights, air conditioning, 16 inch alloy wheels and roof rails. 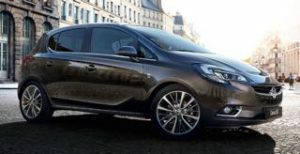 The Vauxhall Astra estate offers a slightly smaller boot but a better infotainment system. We simply prefer the look of the Tipo. 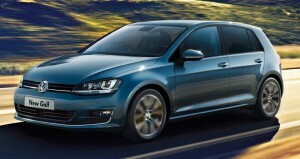 The latest VW Golf, the seventh, builds on the reputation of nearly 40 years of the Golf, the latest model is the biggest, most comfortable and best equipped yet, great to drive with a collection of cracking engines. The three cylinder 1.0 litre petrol is all you need, you really have to experience it to realise what can be achieved with such a small engine, it produces 108bhp and returns a claimed 60mpg, it has a 6 speed gearbox and can reach 62mph in a very respectable 9.9 seconds. The Golf has had a mid life pep up with new tech and light clusters and in the SE trim you get an 8 inch touchscreen which is up there with the best. 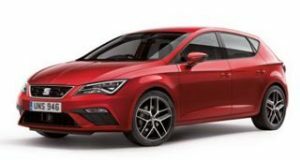 There are other very strong cars to consider and we await the new Ford Focus (due Q3) as it should top the charts, the Mazda 3 is a excellent as is the Vauxhall Astra (Automatic choice) the diesel pick is the Seat Leon with its 2.0 litre 148 bhp diesel unit. The Golf just pips the competition for it’s all round appeal but the British built Honda Civic is a brilliant choice for those that can stomach the quirky stying. The Seat Leon FR Tech has 17 inch alloy wheels, twin exhaust pipes, full LED headlights, electrically foldable exterior mirrors, dark tinted rear windows, 8 inch infotainment system with Apple CarPlay/Android Auto, DAB radio and Sat Nav, sport seats, flat bottomed steering wheel, dual-zone climate control, four different driving modes (Normal-Sport-Eco-Individual), rear parking sensors and lowered sports suspension. It also has a 1.8 litre turbo charged petrol engine producing 178 bhp paired to a 7 peed dual clutch Automatic gearbox that can propel the Leon to 62 miles per hour in 7.2 seconds and on to a top speed of 139 miles per hour. Economy is a claimed 48.7 miles per gallon. Quite a package. The Citroen Berlingo is due for replacement later this year so the prices have been reduced for the outgoing car and it represents super value if size is your thing. Take out the rear seats of the Berlingo and you’ll have an amazing 3,000 litres of boot space. Even with all the seats in place it offers 675 litres with no load lip. Feel cars have air conditioning, cruise control, split opening tailgate, height and reach adjustable steering wheel and height-adjustable driver’s seat but you will have to make do with an ‘old school’ CD/Radio. Engine choice is between a 108 bhp 1.2 litre petrol that can return 55.4 miles per gallon and a 1.6 litre diesel that has 99 bhp and return a claimed 65.7 mpg, this is the better option for those that fill their Berlingo or do more miles. 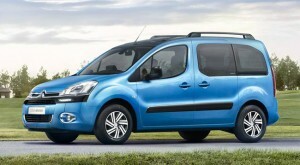 The Peugeot Partner is the sister car to the Berlingo and the Fiat Doblo offers an even bigger boot at 790 litres but the 1.4 litre petrol engine can only return 39.2 miles per gallon.